In a large mixing bowl, combine the flour and salt, making a deep well in the center. Drop in the eggs and water and, with your hands or a large spoon, slowly but thoroughly mix the flour into the liquid ingredients until the mixture can be gathered into a compact ball. Transfer the dough to a lightly floured surface and knead it for about 10 minutes, or until the dough is smooth and elastic. Then shape it into a ball, wrap it loosely in waxed paper, and let it rest at room temperature for at least 1 hour. *Some cooks prefer a mix of ground beef, ground pork and ground lamb. cut off a piece of dough and roll out like a long sausage about 3/4 inch in diameter. Cut it into 3/8 inch pieces that you then rollout, each one about 1/8 inch thick, and proceed with filling directions. Drop 3/4 teaspoon of the filling onto each round, run a finger lightly dipped in water around the edges and fold edges together into a half-moon shape, sealing firmly. Leave in half-moon shape or bring the ends together into a rosette. Line up the filled pelmeni on a piece of waxed paper until done. Bring 4 to 5 quarts of water to a vigorous boil*. Drop about 30 pelmeni in carefully and carefully stir with a wooden spoon. Decrease heat a little. Occasionally stir. Watch that the water does not boil over. When pelmeni rise to the surface they are ready – after approximately 8 minutes. Remove with a slotted spoon and place in serving bowl with a little water or broth. *Optionally you may boil in bouillon – chicken or mushroom broth works best. One serving consists of about 20 pelmeni. To freeze uncooked pelmeni, place on cookie sheets and freeze individually. Bag when frozen completely. 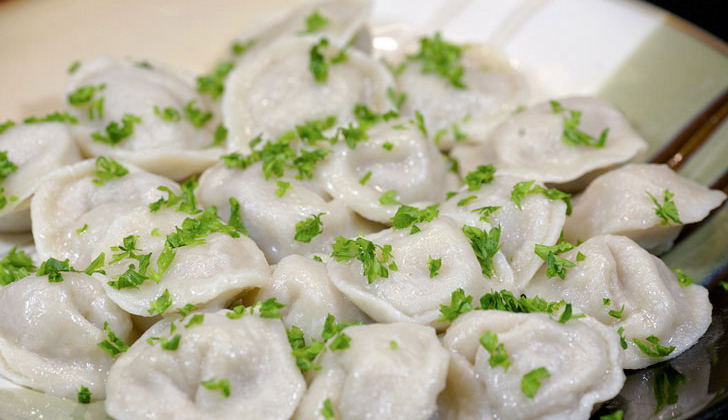 Frozen pelmeni can be cooked in boiling water/bouillon as described above – do not thaw first. Recipe from Olga Mikhailovna Penrose. Olga taught Russian language at Bellevue High School in the 1960s and 1970s. Olga always stressed the importance of learning a country’s culture as part of language study. To that end, her students learned songs, dances, and how to prepare Russian food!